There has been a recent shift amongst those predicting the collapse of the Japanese economy to switch away from the so-called "widowmaker trade" - short Japanese Government Bonds (JGBs) - towards forecasts of a collapse in the Japanese yen (pictured above). Although this may result from learning a lesson from roughly two decades of failed "JGB collapse" predictions, I suspect that this is the result of learning the wrong things. Being structurally short the yen is hardly the safest trade in the world either. The JGB market has not been cooperating with those who have been calling for collapse and hyperinflation; rather yields have marched from stupidly expensive to insanely expensive levels. At a 0.54% yield, the 10-year JGB is at a very interesting position.As I have pointed out before (when yield levels were slightly higher...), the payoff on an outright short position which can be held for a considerable period looks attractively asymmetric. The analysis above still stands. However, I do not give investment recommendations, and someone at a specialist fixed income fund would immediately see why the above comment had to be taken with a grain of salt. I had only pointed out an asymmetry, but there was no notion of a catalyst that will make the position pay off. Looking at the levels of JGB yields now, it is clear that July would have been a bad time to put in place a JGB short. The notoriety of the short-JGB trade has finally caused people to pivot towards "yen crash" scenarios. I will now give some recent examples. In the meanwhile, the Yen has lost 40% of its value and teeters on the brink of an uncontrolled free fall [emphasis mine-BR]. Currency depreciation, of course, is supposedly the heart of the primitive Keynesian cure on which Abenomics is predicated, but there is no evidence or honest economic logic to support the proposition that—–over any reasonable period of time—–a nation can become richer by making its people poorer. I would note that I agree that depreciating the yen is damaging for the welfare of Japanese consumers; but it helps exporters. An undervalued yen was always part of the mercantilist tinge to Japanese policies. But upon news of Prime Minister Abe’s electoral “mandate” to plow full stream ahead, the Yen could plunge through 120 in an instant, and be well on its way to 140 and not so far down the road to 200. (Note that the article was written before the Abe election victory.) His bearishness on the yen is partially based on the Japanese need to import commodities, which I have noted myself as being the potential Achilles Heel for the Japanese economy. But if we look at global oil prices, that potential weakness is not currently an issue. Namely, these madmen through the open market desk at the BOJ are “bid” any and all bonds on offer; and at nose-bleed prices (that is, the inverse of the 0.398% yield) that vastly exceed the true economic value of debt that one day the Japanese government must and will default on. Presumably fear of "The Widowmaker" kept him from dwelling on that rather bold claim. In 'HSBC fears horrible end to Japan's QE blitz as Abe wins landslide', Ambrose Evan-Pritchard discusses some yen bearish calls. David Bloom and Paul Mackel, currency strategists at HSBC warn: "Mr Abe may succeed in driving up wages, setting off a 'wage-inflation spiral'. This may not necessarily lead to a bond rout since the Bank of Japan is effectively holding down bond yields. However, the exchange rate might take the strain instead." He quotes Takeshi Fujimaki as saying, "Once investors see through the BOJ’s camouflage, the yen will spiral out of control to Y200 (to the dollar) and beyond". Since he previously argued that Japan would have hyperinflation by 2015, a yen at 200 is a fairly benign forecast. The advantage of trading the yen instead of JGBs is that it moves a lot, unlike the glacial Japanese interest rate market. Additionally, instead of fighting the Bank of Japan, you are doing what they want you to do: weaken the yen. If people believe that the only reason JGB bears lost money was because they were fighting the central bank, that appears to be progress. I would argue that they learned the wrong lesson. Stock-flow analysis explains why Japan can easily sustain low bond yields and a high debt-to-GDP ratio. It also tells us why shorting the yen has its risks. The Japanese private sector is a massive owner of foreign currency financial and real assets, which represents a short position in the yen. The tendency to want to repatriate profits would cause the yen to get expensive, foiling Japan's export ambitions. Therefore, the Japanese authorities either had to short the yen themselves (thus creating Japan's oversized foreign currency reserves) or set Japanese interest rates at such a low level so that foreign private sector actors will short the yen for them. And many foreign investors are cautious about shorting the yen. During a financial crisis, the risk is that repatriation flows will spike, causing the value of the yen to shoot up. As most people figured out after 2009, trades that blow up during a financial crisis pose particular career risk. Therefore, one imagines that the Japanese authorities are quite happy that many are using Japanese quantitative easing as an excuse to short the yen without taking into account this career risk. To be clear, the yen could easily sell off further. Developed country currencies trade in a wide range around 'fair value' without it having an important effect on the economy (although currency traders will squawk). 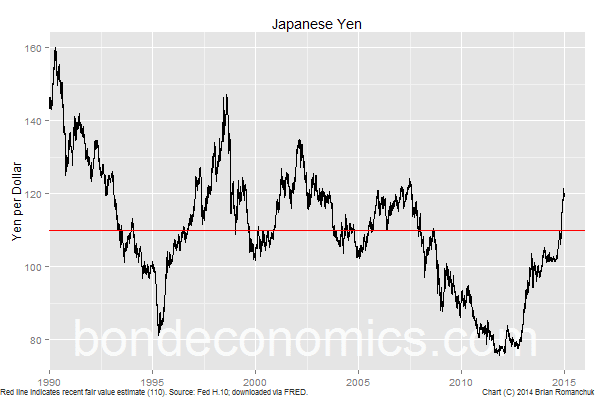 The yen reached around 76 in 2011-2012, which was heavily overvalued versus 'fair value' around 110. (That is a level I have seen quoted; I have no strong opinion on the exact level.) It would have to hit 160 in order to reach a symmetric amount of undervaluation. Therefore, a weakening to 140 is not exactly earth-shattering. Conversely, the global macro backdrop that allows the yen to reach 140 is probably consistent with JGB yields rising to around 1% or so. At which point, you have to ask yourself: which position poses less risk if things do not turn out the way that you expect? My "JGB Collapse" home page. I find these currency collapse scenarios completely untenable. Ultimately in the currency market you still have to settle. And you have to do that every day at 10pm GMT for every open trade. This is an a decentralised market with no official market makers. The simple dynamics of that system mean that when something gets too high or gets too low then you get a pull back that reverses the trend as the system runs out of liquidity. Which means that you're always trying to create a scare story that is sufficiently believable that people will make a trade on fear rather than rational thought. That's where the liquidity has to come from to make the shorts stick in a crunch situation. Or you have a neo-classical influenced central bank that follows the standard script and actually ends up being the patsy in the market that everybody else trades off. The Russian Central bank being the current case in point which is doing the exact opposite of what is required. The Argentine central bank did the same. The Japanese position is the same as any net-export nation. To have net exports they have to create savings in foreign currencies. So lower is better from their point of view and the higher value of imports will be creating some of the 'inflation' that Abe is after. The Japanese will not dollarize like the Russians have. I frankly am mystified by what is happening in Russia. Even with oil falling, I do not see why the currency is dropping a few orders of magnitude worse than what Canada (for example) is seeing. I thought that they had broken their foreign currency debt dependence. It may be that was just sell side propaganda, as I never look at their data. American currency trader decides to buy yen. This choice is a deference of spending. Mr. American has worked to earn money, been paid, and now will spend that money on yen. Japan currency trader decides to buy dollars. This choice is a deference of spending. Mr.Japan has worked to earn money, been paid, and now will spend that money on dollars. When the trade is complete, each trader has deferred spending. Each trader has an investment in property, identical to an investment in gold. Of course currency is not gold but currency is a share of ownership of any resource for sale (that uses the owned currency). It seems to me that each trader will have strong incentive to destabilize currency values over time.. When the trade is wound down, the base currency (meaning the trader's earned-currency) that has the most expected inflation will be the winner. An example: Japan is trying to create inflation. The market has moved the ratio of yen-dollar from about 76:1 in 2013 to a current 118:1. The yen seller in 2013 can repurchase his yen now and receive 118 for each dollar. The dollar seller in 2013 can repurchase his dollars now but it takes 118 yen to purchase one dollar - a big loss. So it seems to me. Yes, currency traders have an interest in their positions running in one direction, and there is a huge amount of gross trading activity by these people. However, they have limited risk budgets, and currency speculators can only get a relatively small net position in any currency (although this net position can be very large for a small currency). The big net flows are for the purchase of financial assets. Although it is nice when your foreign currency asset appreciates, most investors rebalance and will thus harvest profits from positions that increased in value. In the case of the yen, Japanese investors make money on their USD assets, and will want to rebalance back to JPY. This keeps the currency from running too far. To be very clear, there is no sigificant dollar volume of fools buying Russian or Japanese bonds. Almost all bond buying in the whole market is by the central bank. Also, we expected Japan's central bank to keep control of interest rates. If the central bank prints fast enough they can always do this, though the currency does fail. - Russia's problem appears to be that they have non-ruble liabilities. What is happening to them now is what MMT says could happen. - Japan has been running similarly-sized fiscal deficits for a very long time. Why is now any different? - You are looking at the flow of bonds, not the stock. There is still a very large stock of bonds held outside the BoJ. However, those holders have a good grasp of the Japanese economy, and know there is no risk of a hyperinflation or whatever. - You may not have expected JGB yields to rise. But it would be serious revisionism to argue that there were no Austrians running around screaming about "the short of the century". Kyle Bass was buying deep out-of-the-money payor swaptions, which only made sense if yields spiked. As soon as yields spike 30 basis points higher, there will be a lot of people proclaiming the imminent demise of the JGB market. From the point of view of someone inside Japan or Russia, almost every investment outside their country is going up fast. If your 5 year bond pays 0.1% interest per year and everything outside Japan seems to go up, measured in Yen, by 1% most every week, that seems better. It is not that they do or don't understand hyperinflation. The reason it is now is that the rush out of bonds has started. It is like an avalanche, once it starts it feeds on itself. The hard question was when it would start but we are past that now. You are not looking at the stock of money. As the central bank monetized bonds the stock of money goes up. As people see their currency dropping fast, they spend their money faster. The velocity of money goes up. You are missing velocity. Kyle Bass has been saying the Yen will go down. He too expected the central bank to hold interest rates. He has pointed out many times that if interest rates go up the interest on the debt would take all the taxes, and everyone (except some MMT types) would understand they were doomed. Debt in a foreign currency is just one way to get your spending higher than your taxes. It is not the only way. Provoking sanctions, having oil prices drop, lots of things hurting them and increasing the size of their deficit. It is the spending much more than taxes that is the real key metric in predicting high inflation. As I have pointed out repeatedly, your theory implies that we should have seen multiple hyperinflations amongst developed countries with floating currencies, and we have not seen any. Until an actual hyperinflation develops, all I can do is repeat that comment. Please note that although I would like to think of this web site as a modern Platonic Dialogue that will act to spread the Light of Knowledge over the Sea of Ignorance that is fixed income economics, it also has to fill the role of entertaining readers. I welcome debate and corrections from readers. But the comments section has to fit within the business role of the website. (Yes, there is one. This web site will be the platform for selling the books that I am in the process of slowly writing.) I am happy to answer questions, as other readers may have the same question. (There is typically a ratio of 100 readers for every comment; this ratio is even higher here, as I have not (yet) developed a community of readers who argue amongst themselves.) If people disagree with me or each other, the expectation is that it is done in a genteel manner (e.g., no cussing), and it is expected to be entertaining/thought provoking. Your comments show no sign of reading my article. The thesis is that people were wrong about Japan because they did not take into account stock-flow behaviour, in particular the tendency of Japanese to repatriate overseas assets. All your articles and comments make precisely that error. It is boring for me to repeat the same responses, and our conversations probably bore my regular readers. However, if I do not respond, I look bad in the eyes of any first-time readers, that would only see me ignoring you. If you want me to discuss "CMMT" again, read my response that I wrote earlier. Write a full length article on your web site that addresses my concerns. If you send enough traffic here, I would be forced to respond. I have a backlog of articles that I want to write, and topics have a considerable hurdle to meet before I write about them. In my theory hyperinflation is a positive feedback loop. It is like an avalanche, earthquake, forest fire. We can tell when there is a high risk of the chain reaction but not exactly it is going to start. I will leave you alone. All the best. I'm curious what practitioners mean by "fair value." It's a squishy term, but it is usually the central prediction of a model for the bond yield based on fundamental or even relative value factors. Of course, it varies from practitioner to practitioner. There was one strategist (luckily not a portfolio manager) I read who moved his estimate of fair value for the 10-year Treasury by about 300 basis points in one year - which was even more than the bond market moved. You can write "the 10-year bond will return to fair value next year" and everyone knows your intent, but everyone may interpret it differently. The interesting thing is that on most models, bonds are rarely near fair value. How this fits in with finance theory is frankly a mystery. Fair value means what prices would be if central banks were not manipulating bond prices. You can only estimate it, of course. Since "fair value" is an estimate of where the market thinks short-term rates will be, and the central bank administers the short rate, it is nearly impossible for a central bank not to manipulate bond yields. One could argue about a 30-year bond, but the 10-year tracks the trend in short rates.